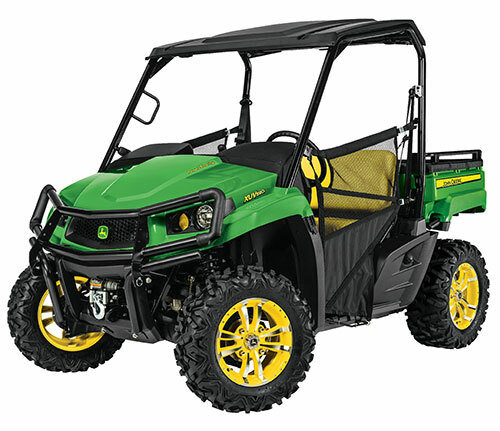 The new John Deere Gator XUV590i Crossover Utility Vehicles were designed for landscape contractors who desire performance, comfort and customization. Equipped with a powerful 586 cc, 32 horsepower, liquid-cooled inline twin-cylinder engine, independent four-wheel suspension and availability of more than 75 attachments, the XUV590i provides an unparalleled balance of performance and work capability in the mid-size class. The XUV590i offers operators 10.5 inch minimum ground clearance, 800 lb. load capacity and 1,100 lb. towing capacity. The Gator XUV590i features a large, 7.4 gallon fuel tank to keep the vehicle running longer between fill-ups.